For a real estate agent, the listing appointment presentation is the way to dispel any doubt in the homeowner’s mind about their plan to sell with them. At the end of the presentation, the agent should not only walk away with a listing contract. They should also have won the seller’s complete trust and cooperation. The introduction makes the sellers aware of the agent’s background and competencies in addition to giving them an understanding of how the brokerage tackles the job of selling a property. It is here that the homeowner learns and can weigh in on what their relationship with the agent will be and what can be expected from them and the team they represent. The listing presentation communicates all the information that they agent has garnered from pre-listing activities and how this shapes the selling strategy for this property. This strategy not only includes pricing but also the agent’s recommendation on the most effective way to market the property to the right audience. Finally the contract must be signed to make this professional relationship official. At this time, all details and clauses will be reviewed and any other questions will be addressed to prevent misunderstanding or unhappiness as the agent and homeowner continue in through this process. The format in which an agent compiles and shares the details of their listing presentation can go a long way in solidifying the seller’s trust in their strategy as well as colleagues’ recognition of their abilities. 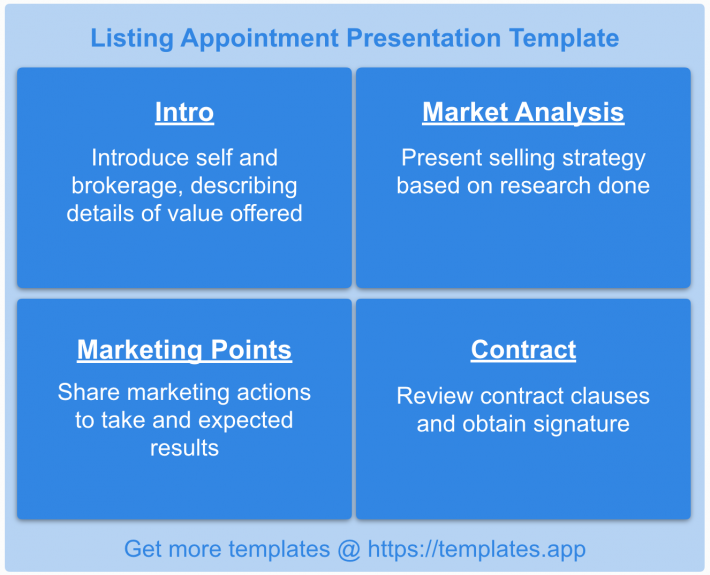 This four quadrant presentation template offers an optimal framework to write out, present and then share the details and documents of the listing presentation. 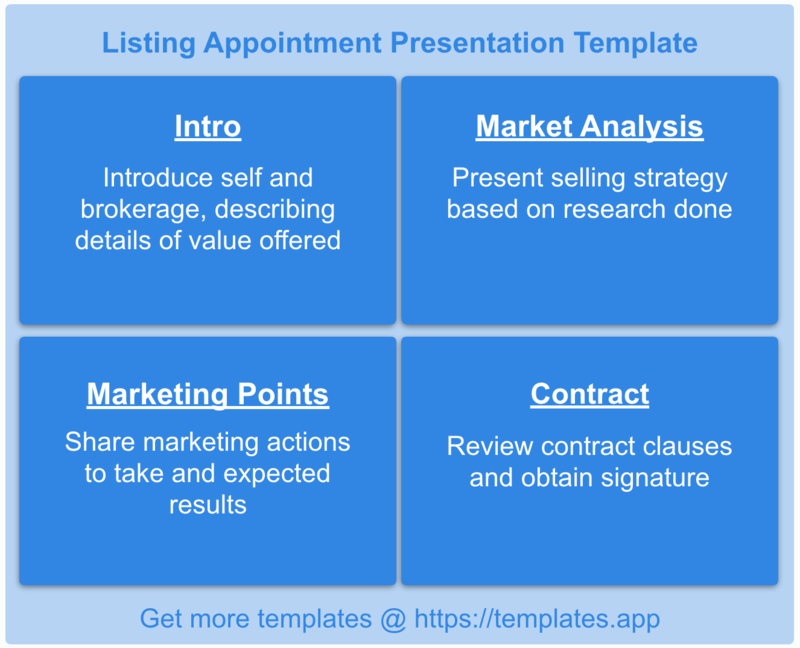 You can view, edit, launch and share the Listing Presentation Template in Priority Matrix to make your listing appointments do more for you.